A ground-breaking event at the Royal Society of Medicine with a group of open-minded and hearted individuals who wanted to dive deep into the research and experiences of death and dying. Some truly incredible insights and conversations from key researchers in the field including Peter Fenwick, Monika Renz, Sue Brayne and Hermione Elliot. Short summaries and key take-aways from their talks can be found if you scroll down. The Death Incubator is a next generation Death Café experience incorporating digital/analogue, sci-art explorations of death and dying based on the most cutting-edge research findings and understanding. It provides a curated self-directed learning experience over one month that culminates in an intensive, immersive retreat day and follow up integration session. Attending this conference was a confirmation that this collaboration is on the right track and just how necessary this work is to open up conversations on a topic that still remains taboo. Death is so frequently only considered at the moment it occurs. Yet many of the great thinkers, artists and psychologists agree – regular contemplation of death leads to a more fulfilling life. Check out these two short videos below. Our first collaboration Death is Fake News was featured in Psychologies Magazine (Spring 2019 edition). The next upgrade is our Summer 2019 Death Incubator which runs from May 6th to July 3rd. Below is a short summary of each of the presentations from the conference. Much gratitude to the Palliative Care Section at the Royal Society of Medicine for the bursary they provided for us to attend. Monika Renz is the Head of the Department of Psychooncology at Cantonal Hospital St Gallen in Switzerland. She presented data from a large scale study exploring the transitions that occur in the dying process. Captured in a number of research papers and in her recent book “Transitions” this work blends participant observation ethnographic methodology with descriptive statistics. Her work has captured the process of dying in a large sample of individual and drew out themes via interpretative phenomenological analyses. Most notable from her findings was the observation of an inverse relationship between pain, denial and fear and spiritual experiences. 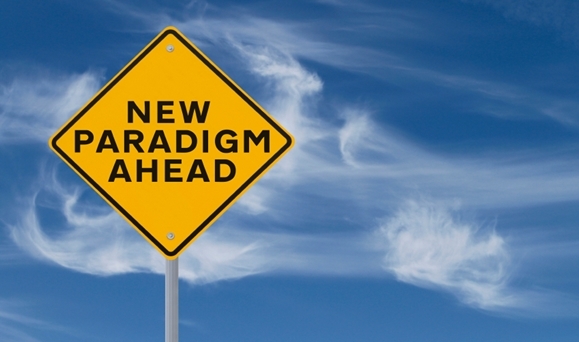 When spiritual experiences were present, indicators of fear, denial and pain were reduced. This work implies that as individuals transition they make contact with a place/space of consciousness where they move “out of fear” and no longer experience pain. Monika’s work suggests that there is a pre-transition phase which individuals may move in and out of several times before finally transitioning to death. These perceptual transitions were mostly independent of medication status. This information is very helpful for the relatives as it provides them with a structure to understand what is happening to their loved one. Interestingly those in the sample (N=9) who had experienced a prior Near-Death Experiences or spiritual/mystical did not experience the same levels of pain, fear and distress in the dying process. This suggests that touching the transcendent in a NDE may confer some advantages when facing the final death experience. 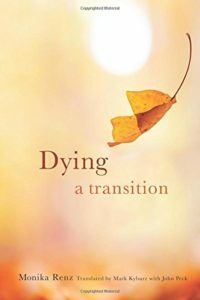 She concludes in her 2017 article that “approaching death seems not only characterized by periods of distress but even more by states beyond fear/pain/denial” (Renz et al., 2017, pg. 1). One hypothesis then, is that a virtually mediated near death experience may go some way (but not the whole way) to supporting a more positive attitude to death and dying which may in turn, reduce the associated fear, pain and denial response that is commonly seen. Key Message: Death is an expansion. Do not be afraid. Stay curious. Dr. Peter Fenwick is a consultant neuropsychiatrist emeritus to the epilepsy unit at Maudsley Hospital, which he ran for 20 years. He is also an advisor to the Virtual-Awakening team and the Death is Fake News Project. See his amazing Ted talk on “The Final Border”. You can also find a wealth of resources from Peter at the IANDS site. Peter’s presentation provided a beautiful description of death bed coincidences and terminal lucidity (amongst other phenomena experienced in the dying process). 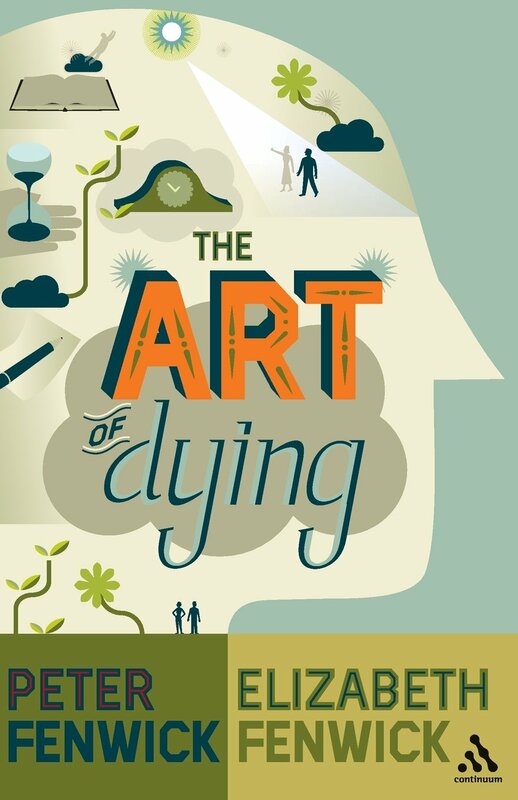 Much of what he described is in his recent book, The Art of Dying, written with his wife, Elizabeth. One part of his message was that these experiences can be very helpful for the dying and as such must be honoured and not dismissed as “just hallucinations”. His extensive research on a number of large-scale projects points to several important aspects. Firstly, that this area is still very under-researched. Secondly, that there are cultural differences in how health care providers are trained in their understanding of these issues. Thirdly, there is much need for more training for professionals. Peter’s work also suggests that there is a strong need to create training materials that can support staff and carers of those going through the dying process to help them understand deathbed visions, terminal lucidity and other so-called “para” phenomena that are reported. Using VR may be one medium to help in this process, giving staff and carers and embodied experience of what has been reported in the literature in order to enhance empathy and understanding. Sue Brayne is an end of life researcher who has also had her own experience of mystical stages. As a trained nurse, a researcher into end of life phenomena and a psychotherapist, she specialises in end of life issues and grief work. He talk explored the liminal space. The place that helps us to transition from one state of being to another. She pointed to the benefits of having a healthy interest in this space but also know – it can get messy! She postulated that the claustrum could be a possible brain region that mediates the transition into the liminal space. 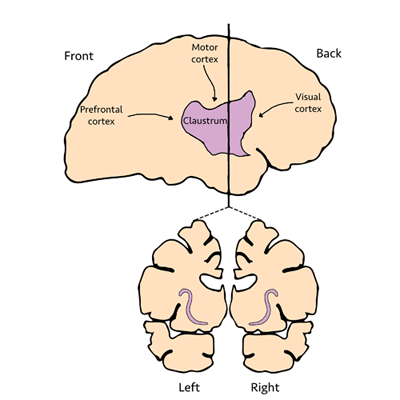 The claustrum is a “thin, irregular, sheet-like neuronal structure hidden beneath the inner surface of the neocortex in the general region of the insula. Its function is enigmatic. 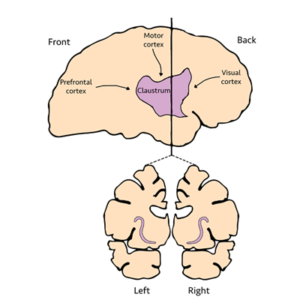 Its anatomy is quite remarkable in that it receives input from almost all regions of cortex and projects back to almost all regions of cortex.” (Crick & Koch, 2005). This work suggests that this densely interconnected region gives rise to integrated conscious perceptions and therefore, as consciousness is altered in the dying process, there may be functional changes in this part of the brain. When we no longer have a “binding” conscious experience we could be open to other types of consciousness. It is wise to not be too specific about particular brain regions as it is likely that the conscious experience requires a whole dynamic network to create the emergence of consciousness. However, there are likely to be several critical “hubs” in this network and perhaps the claustrum is one of those. Sue’s website offers a wealth of information including some helpful links. Key Message: The liminal space is messy! Embrace the mess. The final presentation was by Hermione Elliot who is the Director of Living Well, Dying Well. This not for profit training organization was set up in 2011 to run awareness raising workshops for the public and develop end of life Doula training. Hermione’s talk was full of wisdom and kindness as she shared her experiences and also some top tips of how to take back control of the dying process. There are no experts in dying, she suggests and we need more story telling about positive and peaceful deaths. The emphasized the role of trust and safety in the dying process and how we might try to facilitate that for those who are dying. Having a death plan should be like having a birth plan (she suggests) and finding ways to ensure that the wishes of the dying are well communicated and respected is critical. “Don’t hand over your death to anyone” she suggests and get planning now! A very interesting part of the discussion was about informed consent regarding medical interventions at the end of the life including CPR (resuscitation) for the frail and elderly. Hermione’s work is all about educating the public around the hard facts that are difficult to hear – including the way in which the medical system tries to maintain life at all cost (and what the costs are for the individuals and the families). You can see Hermione talk about this on this short video. Advanced directives, well communicated, are vital. Critical to the whole endeavour is the professional’s own relationship to death as this will impact on all their dealings with the dying. Just as psychotherapy is best conducted by a therapist who know their own “stuff” intimately, so those working with the dying need to examine and be in a close relationship with their own death. These words are very close to the heart of the Death Incubator project. We have aspirations to use our developing methodology to support training for professionals work in this field understand more about the death process based on the research shared at this conference. Through this understanding, they can then support others through the dying process in more skilful ways. Key Message: Take back control of your death process! 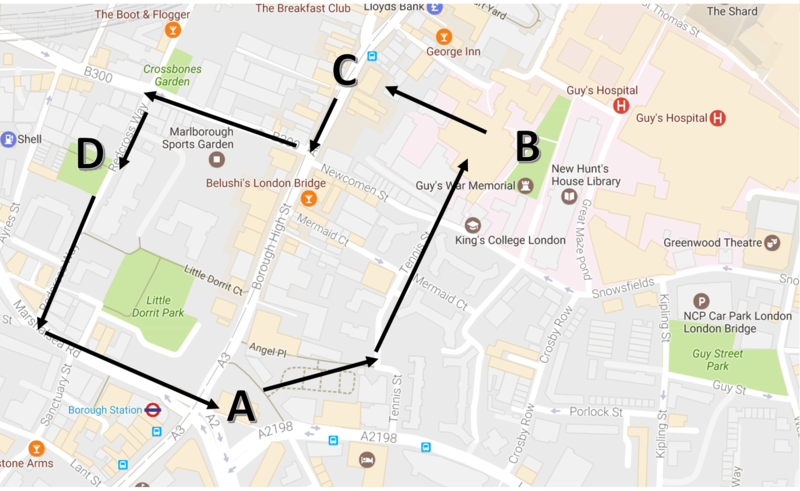 If you would like to find out more about the Death Incubator or attend our first Death Incubator experience in London (June 22nd) please contact admin@mindbodymot.com for more information or see our page at Virtual-Awakening. Tamara and Jose will be at the Association of Transpersonal Psychology 50th Anniversary conference in California in April 2019. Jose will be presenting at Mystics and Scientists in London in April 2019 and Breaking Convention, London, August 2019. Tamara will be presenting at the British Psychological Society Transpersonal Psychology Section Event June 8th 2019. Let’s talk about paradigm shift in psychiatry…..
Mindfulness Take over at Dragon Cafe – Tai Chi Safari May 1st ….